Dr. Michael Skinner will demonstrate the utilization of a tapered groovy implant to replace a tooth that was fractured below the crestal bone. The tapered groovy implant provides for bone condensation and an optimal fit for extraction sockets. 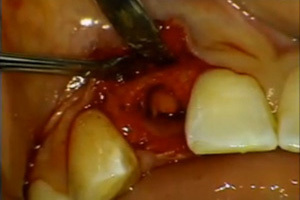 The tooth was extracted using rotary instrumentation to allow luxation of the root tip atraumatically. Assessment of the apex of the tooth for implant placement revealed inadequate positioning for the placement of the implant. A purchase point in the socket was made for sufficient angulation of the implant. The insertion torque that was achieved allowed for immediate temporization of the temporary. A bone graft was placed to fill a space between the facial cortical bone and the implant. With this procedure the patient avoids having to have delayed placement and a removable partial which provides increased patient satisfaction. State benefits of using the tapered implant. Describe removal of tooth structure to provide atraumatic removal of the root tip. Understand how to assess position of implant placement. Determine what conditions must be met to allow for immediate temporization.